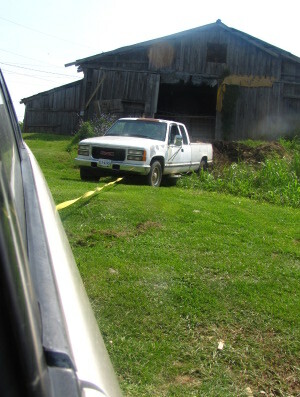 I parked a little too close to a horse manure pile last week and got the truck stuck. A new group of weeds had grown up around the base of the pile hiding some of the richer material and I forgot to bring a shovel. This picture is Anna pulling me out with the tow strap. I've lost count on how many times we've used that tow strap since it entered our tool bag. a little toyota pulling a big gmc out of the horse pile::::::::::::: what a sight... you should have taken a better picture, where the toyota was seen better. and sent it to toyota. they need that kind of PR. Mark was overheating after walking a couple of miles to town to find a phone in the heat, so I didn't want to push my luck by pausing for a photo shoot. I took this photo on the sly just before he gunned the motor. I have found myself in such a situation a few times during the winter season. It's at those times I wish I had 4 wheel drive. either way, there always seems to be someone, or something around to bail me out. Great post and keep up the good work.